Donegal or Donegal Town ( or ; Irish: Dún na nGall, meaning "fort of the foreigners") is a town in County Donegal in Ulster, Ireland. The name was historically written in English as 'Dunnagall' or 'Dunagall'. Donegal gave its name to County Donegal, although Lifford is now the county town. From the 1470s until the very early 17th century, Donegal was the 'capital' of Tyrconnell (Irish: Tír Chonaill), a Gaelic kingdom controlled by the O'Donnell dynasty of the Northern Uí Néill. Donegal sits at the mouth of the River Eske and Donegal Bay, which is overshadowed by the Blue Stack Mountains ('the Croaghs'). The town is bypassed by the N15 and N56 roads. The centre of the town, known as The Diamond, is a hub for music, poetic and cultural gatherings in the area. 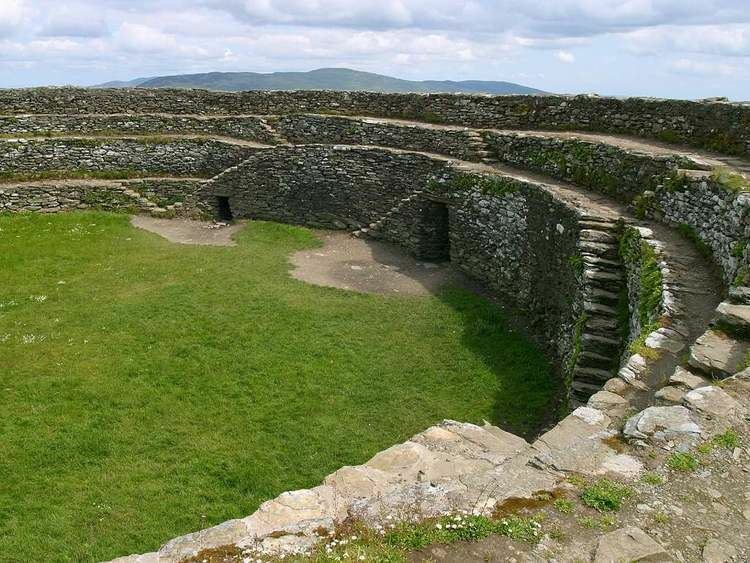 There is archaeological evidence for settlements around the town dating to prehistoric times, including the remains of ringforts and other defensive earthworks. Saint Patrick was captured by raiders from the clans governed by Niall of the Nine Hostages, and this region is that to which Patrick returned, being familiar with the people, language, customs and lands. The first clan to convert to Christianity as the result of St Patrick's efforts was Clan Connaill (also known at one time as Clan Dálaigh: in English, this is pronounced Daley and it translates as "one in a leadership role"). Connall was a son of Niall of the Nine Hostages. As a result of their acceptance of Christianity, Patrick blessed the clan members; the sign of the cross appeared on the chieftain's shield and this became not only the heraldic device for the clan but also for County Donegal. Donegal Town itself is famous for being the former centre of government of the O'Donnell dynasty, the great Gaelic royal family who ruled Tír Chonaill in west Ulster for centuries and who played a pivotal rôle in Irish history. Their original homeland lay further to the north in the area of Kilmacrennan. From the 15th to the 17th century, they were an important part of the opposition to the colonisation of Ireland by England. The town itself contains Donegal Castle, on the banks of the River Eske, and the remains of Donegal Abbey a Franciscan abbey which dates back to the 15th century on the Southern shore of the Bay. The Annals of the Four Masters may have been partially written in the old abbey in the 1630s. The story of Hugh Roe O'Donnell (Aodh Rua Ó Domhnaill, also known as "Red" Hugh II), Lord of Tyrconnell, was the inspiration behind many books and films, not least, Disney's The Fighting Prince of Donegal. In 1601 the Siege of Donegal took place during the Nine Years' War. After the Flight of the Earls from near Rathmullan in September 1607, the castle and its lands were seized by the English Crown and given to an Englishman, Captain Basil Brooke, as part of the Plantation of Ulster. Viscount Brookeborough was granted the castle around 1611 and he proceeded to carry out major reconstruction work and added a wing to the castle in the Jacobean style. The current plan of the town was also laid out by Brooke, including an attractive town square known as The Diamond. From the late 17th until the early 20th centuries, Donegal Town formed part of the vast estates of the Gore family (from 1762 Earls of Arran in the Peerage of Ireland) and it was during their ownership that the town took on its present appearance. Donegal Borough returned two members to the Irish House of Commons, the lower house of the Parliament of Ireland, until the Acts of Union 1800 came into force in January 1801. Evidence of the Great Famine still exists, including a workhouse, whose buildings are now part of the local hospital, and many famine graves. Dedicated to Saint Patrick and 'the Four Masters', this Catholic church was built in the early 1930s and was completed in 1935. Known locally as 'the Chapel' or 'the Town Chapel', it was designed by Ralph Byrne, the famous Dublin architect, in a mixed neo-Irish Romanesque and neo-Gothic style. This Church of Ireland church was built in a simple Gothic style mainly in the late 1820s and was completed in 1828. The main church appears to have been designed by a Mr Graham of Donegal Town. A chancel was added in 1890. The chancel of 1890 was designed by the office of J. Guy Ferguson in Derry and built in a neo-Gothic style by James McClean builders from Strabane. There are many sandy beaches in the area of Donegal, such as Murvagh beach, and some boasting good surfing conditions, such as Rossnowlagh. Donegal is also used as a base for hill-walking in the nearby Blue Stack Mountains. The town has many hotels catering for visitors, and nearby towns such as Letterkenny offer public swimming pools, cinemas and large shopping centres. Like most clothing manufacturers in Ireland, the size of the workforce has been in decline for many years. Donegal also has a long tradition of weaving carpets. Donegal Carpets have been made in Killybegs for over one hundred years and have been found in Áras an Uachtaráin, the University of Notre Dame and the White House. The Bus Éireann service number 64 Derry/Galway route: this makes several other stops including Letterkenny and Sligo (which allows for rail connections by Iarnród Éireann, from Sligo Mac Diarmada railway station in Sligo to Dublin Connolly railway station. This route also allows for rail connections from Londonderry railway station to Belfast, via Coleraine. The number 30 Donegal Town/Dublin route which makes stops at other key towns such as Enniskillen (which provides connections to Belfast via Ulsterbus). Two private companies operate the other routes: 'McGeehan Bus' operates a regular service, from Glencolumbcille and Dungloe in West Donegal to Dublin Airport and Busáras in Dublin, which passes through the town; while Feda O'Donnell Coaches (also known as Bus Feda) operates a regular Glenties/Galway service that stops in Donegal. Donegal railway station opened on 16 September 1889 and finally closed on 1 January 1960. The site of the old station is now used by CIÉ as a bus depot while the actual building is the home of the Donegal Railway Centre. Donegal town is home to many amateur sports clubs. The most popular sport in the area is Gaelic football and the local GAA club is Four Masters. The club also has been developing hurling. Other popular sports include soccer, rugby union, basketball and track and field. Donegal Town was host to the final stage of the World Rally Championship on 1 February 2009 and was viewed by 68 million people worldwide. The town is home to the regional newspapers Donegal Democrat and Donegal Post and the local Donegal Times newspaper. The Northwest Express regional newspaper is also distributed throughout the town and surrounding county, as is The Derry Journal. Ocean FM, an independent local radio station from Collooney in County Sligo, has one of its three studios in the town, which broadcasts to most of south County Donegal. Highland Radio, which is based in Letterkenny, can also be received in the town. Donegal Town was host to the final stage of the World Rally Championship on 1 February 2009 and viewed by 68 million people worldwide.